Woohoo! As you all know, music is an expansive topic, and indie music, though specialized, is diverse and ever-evolving. It’s difficult to sift through the rocks and the gems, especially all by myself! When my friend, Harmony, offered to be a contributor, I was STOKED! I didn’t think I was at that level, but it turns out I am. I have a LONG list of albums I’ve been meaning to review… So, I picked a couple, and she ran with them! So, without further ado, I give you: Harmony. 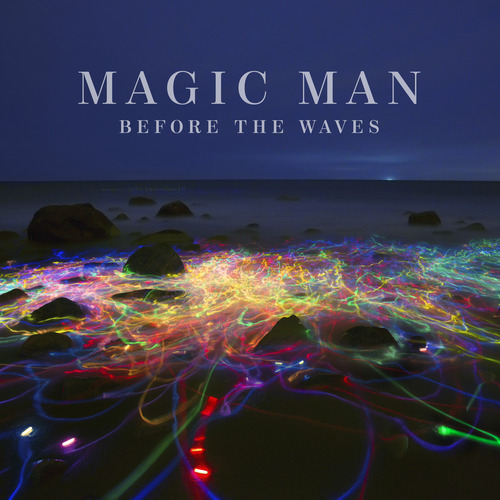 Boston, MA band, Magic Man, released a new album entitled “Before The Waves.” Now I am not gonna lie I had heard their song “Paris” on satellite radio and thought to myself hey these guys are pretty good but I am so glad I had to opportunity to hear their new album as well because it definitely did NOT disappoint. To put it simply this album is a TSUNAMI of rock, pop, electro and synth. This album has an upbeat electro pop feel and each song on it is perfectly uplifting and makes you want to dance! 1: Texas: This track was unlike anything I’ve heard before it begins by fading in and creates an explosion of sound in your ears. Overall it is very upbeat and the chorus is extremely catchy. 2 : Apollo: Reminded me a little of bad suns with the upbeat danceable melody and undeniable sing along chorus. 3: Paris: This track slowed things down a bit which I thought was a nice balance for the album. It saves it from sounding the same. The melodic piano parts balanced out the entire track. 4: Catherine: It is unknown who Catherine is or if she’s someone real but I imagine she would love this track. The boys made this song as an ode of their love for her. Ladies if your name is Catherine this is one of those tracks you can pretend is about you with your girlfriends and dance to it all night. Again the upbeat melodies make this song sound like a modern pop song because everyone from Lady Gaga to One Direction is using dance and synth beats. It’s nice to hear it come from an alternative band who is taking it in a different direction. 5: Chicagoland: Again with the slow intro and the wave of sound along with the catchy chorus. This song is undeniably going to get stuck in your head. 6: Honey: This song is slower than the others on the album and reminds me a bit of being in space. I am not sure that’s just what it sounded like! The slow beginning builds with phantom vocals and echoing synth and they both marry each other perfectly. I really enjoy this song because it is a bit on the softer side but still goes hard. Amazing! 7: Tonight: Incorporates the synth and upbeat melodies with a catchy chorus. 8: Every Day: This song is the more reminiscent of the electro wave era of the 1980s. The synth and the beats everything reminds me of a modern Duran Duran track. 9: Out of Mind: This track also reminded me of a 1980s track from the electro era but is definitely upbeat, synth-y and danceable. 10: Waves: This song lives up to the name I imagine a sunny day near the waves anyone? This song is perfect for a day by the beach. 11: Too Much: This track had less synth but it worked! Still very upbeat and also had a feel reminiscent of the new wave 1980s. 12: It All Starts Here: The softer sound makes this track undeniably a good choice to end the album. Lyrically it is probably my favorite song on the album. I would recommend checking this album out if you really love synth, dance pop music. It’s great for a get together with friends or if you’re having a bad day and need to have something positive to hear. It is also a perfect album for cardio because each track is unique but upbeat. I would say that I would give this album 4 diamonds out of 5. Overall, these guys really live up to their name and you can tell they used their “magic” (see what I did there) on every track. Enjoy! the moment this time I am visiting this site and reading very informative posts here.